But this is not a Porsche. Here they are on their usual perch in the Bivouac. The Ruf family had a garage where they worked on all sorts of machinery, primarily repairs. One day, someone’s Porsche 911 broke down and they looked to Ruf to repair and revitalize it; the idea struck to build their own twist on the beautiful sportscar, but legally, they had to register as a manufacturer of their own to sell them. Thus, the RUF marque was born. But this is not a RUF. Two Champions in the field! As a matter of fact, you can feel free to go right on down the list; of all the myriad manufacturers putting their own spin on the recognizable Porsche styling, but no matter what you choose, as the youth say, “this ain’t it”. As a matter of fact, I can’t even tell you what toy company made these. What I can tell you is that I’ve had these for a while. Two of them, anyways; recently, my family has moved a few times, and each time I went through the stuff they were looking to give away, it seemed like I found another. The quartet was only completed(?) about a year and a half ago, when one turned out to be behind my grandmother’s home entertainment system. Porsche never really left toy licensing, as far as I can tell, but in 2000, Electronic Arts’ Need for Speed series released its fifth entry, Porsche Unleashed (or so it was named in the States, at least, but it’s the one with the name “Porsche” in it), which eschewed all other car manufacturers in favor of just Porsche for the entire game. Not long after this, the automaker signed an exclusivity deal with Electronic Arts to only appear in their titles. This meant that for a lot of my childhood and teen years (and adulthood so far), Porsche was a non-factor in many of the games I played. They were often replaced with RUF (legally a different manufacturer, remember? ), if they appeared at all, which has led to all manner of games including the touring series that Porsche was known for, well, without them. Or with thinly-veiled stand-ins. They only recently gave up on the exclusivity deal, after feeling it harmed their brand visibility; you may have noticed them abruptly appearing in heavy focus in nearly every racing game since, regardless of if it makes sense, just because they can now. 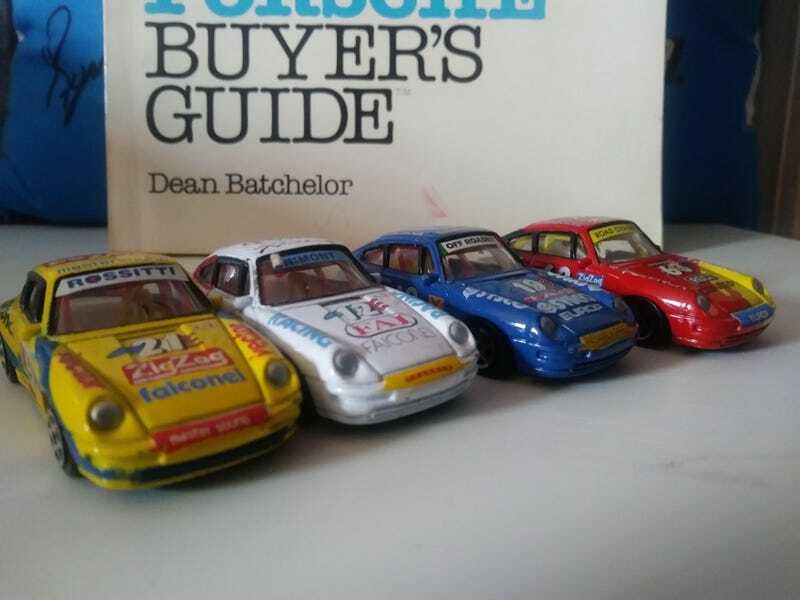 I think of that quite often when I look at these; they are absolutely obviously 911s, but bear no name or mark of such, and the names they do bear in sponsors and team names are gloriously bizarre or thinly-veiled in their parody. Sadly, as you can see, the seat came out while getting these photos. Or at some point before and I just didn’t notice. These cars have been with me quite a while, and I’m glad to have them front and center now. I am lacking a whole lot of info about where they were produced, if they were a set, or if I’m missing a few, though; if anybody has any info on these, do let me know!